How time flies when you’re tired. One month has passed since Elsie shot into our lives at 12:02am on 21st May 2016. I had intended to do weekly write-ups of her progress in the first month but I’ve barely had time to sneeze. Matt went back to work the week after Elsie was born. 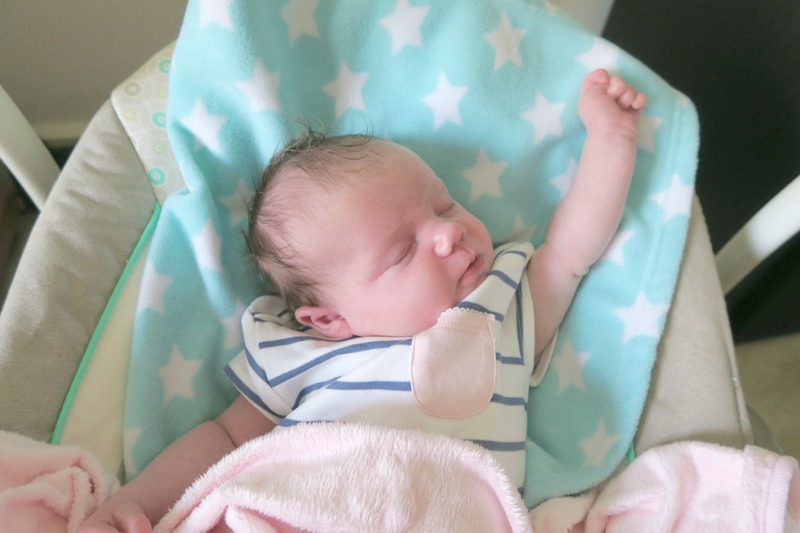 It was half term and so there was no pre-school for Florence (bad timing or what), Elsie had just about found her lungs and I was feeling battered and bruised. The post labour high lasted a few days and then I felt like I’d been hit by a truck. This past month has most definitely been fuelled by Nescafé! 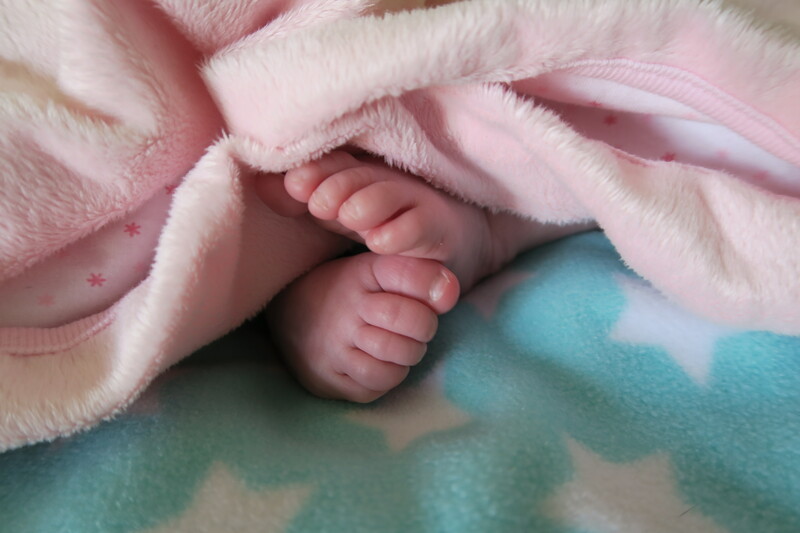 Elsie is now outgrowing her up to 1 month clothing and seems to best fit 0-3mths; where’s my baby gone?! Im already facing the prospect of bundling up and selling the clothes she’s barely worn and already grown out of. It makes me a little sad….and a little broody eeek! I’m not surprised though as she loves her food. We’ve just stopped combination feeding and she is solely formula fed. She’s taking around 3oz every 2-4hrs. Sometimes she takes more, sometimes less. Thankfully he reflux seems to have sorted itself out and she hasn’t projectile vomited in some time. The early days saw us covered in milk daily. We seem to be developing some kind of routine without even trying really. Elsie has her last bottle around 9pm in the evening and then I take her up to bed whenever I go. She will usually go down ok and next wake at 12:30am, 3am and 5:30am. If I’m lucky I can get her back down again until 7am. Matt and I have been in seperate rooms most nights since Elsie was born. Matt works 7:30am – 6pm and I feel he needs a good nights sleep to be able to work properly. Friday’s and Saturdays we tend to all sleep in the same room again which is nice. Elsie spends a lot of the day awake which I guess helps her to sleep at night however it does not help the housework, ironing, blogging or any other task get done! The best parts, at the moment, are seeing Elsie smile. It’s probably due to wind but she has a beautiful smile which takes over her whole face. She reserves the biggest smiles for Daddy! Florence is loving her little sister now and regularly asks to kiss and cuddle her. She loves to help change Elsie’s nappy or put her bib on. Logan’s taking it all in his stride, after all this is the third younger sibling for him if you include his brother on his dad’s side. I’m loving our little family, even if I do look like death warmed up. 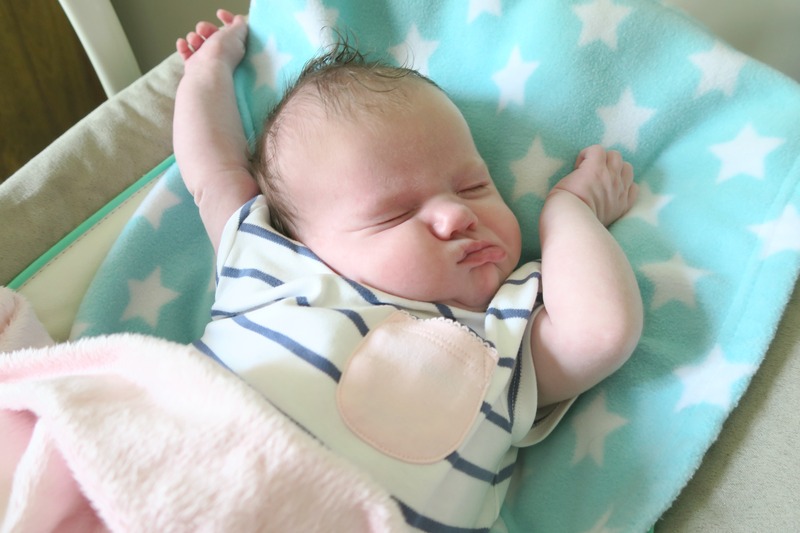 See you back here on 21st July for Elsie’s 2 month update! Previous Post Brewhouse & Kitchen – A Father’s Day Disappointment! Next Post My favourite room: our kitchen! What a gorgeous little girl! It sounds like she is feeding very well, but no wonder you’re exhausted! Newborns do tend to have that effect, don’t they? I’d completely forgotten how tiring the tiredness is! A travel-loving family of six from Cheltenham, Gloucestershire.